Today I’m linking up with Mama Kat’s writing prompt: What was the last thing you bought? 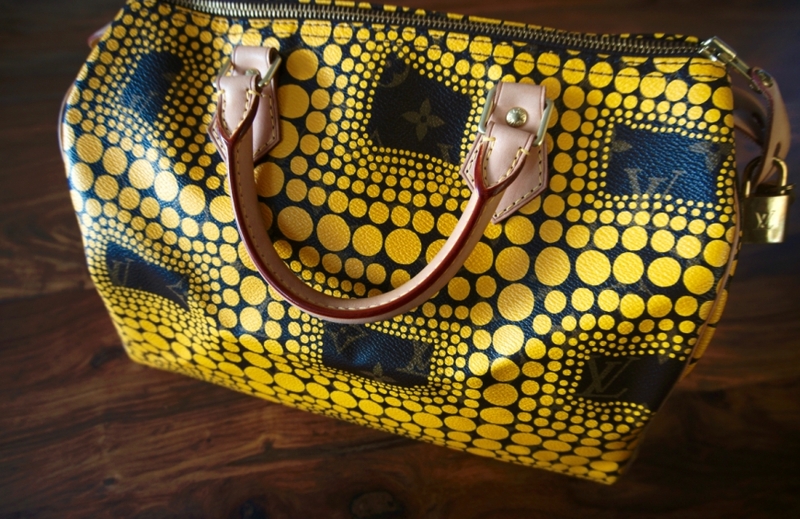 The last thing I bought was a Louis Vuitton Kusama purse. Okay, so it wasn’t the last thing I bought, but it is by far, the most fabulous purchase that I have ever made thus far – made even more fabulous by the fact that I bought it in Paris with my girlfriends. Of course there is a story (cue flashback music, a dreamy movie transition and a shot of the Eiffel Tower). It was a Saturday, one of our last days left in Paris. While riding the escalator in Printemps, one of the grand magasins, we saw this below and quickly rode back down to get a closer look. It was a Louis Vuitton Yayoi Kusama pop-up store – one of only six in the world. And here we were, in Paris, for the launch of the limited edition collection. This was not an accident, no this was fate. The purses were gorgeous – GORGEOUS! – however such a grand purchase should not be made hastily and the store was closing in 15 minutes. We decided to go home and think about it and do some more research. After some thought yes, we decided, this was a purchase that we had to have. For all but one of us, it would be our first Louis Vuitton purse; what better place to buy it than Paris? There was only one problem: the store was closed the next day, Sunday, and our plane back to Atlanta was leaving on Monday. But we had a slim window of opportunity and devised a plan. We determined that the store opened at 10:00 a.m. Our driver was meeting us at the apartment at 11:30 a.m. If we orchestrated our morning with military precision, we had a chance. 7:00 a.m. Wake up, finish packing and have the suitcases waiting in the foyer, ready to go. 9:15 a.m. Leave the apartment for the 30 minute walk to Printemps. 9:45 a.m. Arrive at Printemps. 10:00 a.m. The minute the doors open, head directly to the Kusama boutique. 10:30 a.m. Purchase the purse and go to the VAT refund office. 11:00 a.m. Walk back to the apartment to meet the driver. As you can see, there was no room for error. No one could wake up late. We could not get lost walking to Printemps. We could not stroll and talk, like we usually did. We were on a mission. We arrived at the store, at 9:45 a.m. as planned. And we weren’t the only ones. We were especially nervous when a bus dropped off 100 tourists minutes before opening. At exactly 10:00 a.m. we made a beeline for the Kusama store and started looking and deciding. Except….this collaboration was extremely popular and most of the bags were sold out. Worldwide. The purse that I wanted, the yellow Kusama Speedy, was sold out at Primtemps, but the clerk called Galeries Lafayette, a grand magasin 4 blocks away. They had one Kusama left in their Louis Vuitton boutique. I shouted to my friends that I would be back and took off running. You know how they say that when you need it, you get strength that you didn’t know you had? Like a mother lifting a car off of her child single-handedly? That was me racing for my Kusama purse. I had developed a blister on my foot early into our trip, so by the end of our week I was in serious pain, bandaged and limping. But you wouldn’t know it from the way I ran. I was weaving between commuters and dodging cars as I crossed the streets; I didn’t feel any pain at all. I ran in the right direction and straight to the correct store. If you know Galeries Lafayette, you know what I’m talking about – it a huge multi-building store and it’s very easy to get lost. I had been there before, but it’s not like I go there every week, and I had never been in the Louis Vuitton boutique – I had no idea which building to enter or on what floor. But on that day my feet knew what my brain didn’t; I entered the correct building and through the correct door. Once inside I stopped for a minute to catch my breath and instinctively turned towards the stairs. Taking them two at a time, I landed right at the Louis Vuitton boutique. Of course, there was a line. Not a terrible line, maybe there were six people ahead of me, but a line nevertheless and I didn’t have much time. The Louis Vuitton staff give personal one-on-one service, so I had no choice but to stand in line until someone was free to assist me. Once she did, the transaction was swift because I knew exactly what I wanted. Buying my purse was a very nice, luxurious experience. While the sales person wrote up my order, I took photos of myself in the mirror with the purse. And this is when an already hectic morning gets even crazier. What were the odds that I would find my wallet in a department store full of people? Extremely low, but thankfully, in my favor. My wallet was inside the boutique, on the counter; I had taken it out to give my license to the sales person and got distracted by my diminishing amount of time. Wallet in hand, I went to pay for the purse….and that’s when I noticed that my fingers were covered in red. Was I injured? I didn’t feel injured. No, it wasn’t blood – it was lipstick. The cap to my long-wearing lipstick had come off and the inside of my purse was covered in red lipstick, as were my fingers. I grabbed some tissues to handle my credit card and then raced to the bathroom to wash my hands. Long-wearing lipstick doesn’t wash off very easily, so I had to scrub several times. I still had to go do my VAT refund paperwork and had only about 5 minutes to make that happen. Thank God there wasn’t a line, but I was a mess. When I sat down at the desk of the VAT clerk, I dumped out the contents of my purse – all covered in red. Apologizing profusely – in both French and English – I did the transaction and she gave me a plastic bag for all the lipsticked items in my purse. I ran back down the street to Primtemps (this time I felt the pain in my foot), met my friends in the Kusama pop-up store in enough time for one more photo in the Kusama pop-up store. We made it back to the apartment in time to meet the driver. 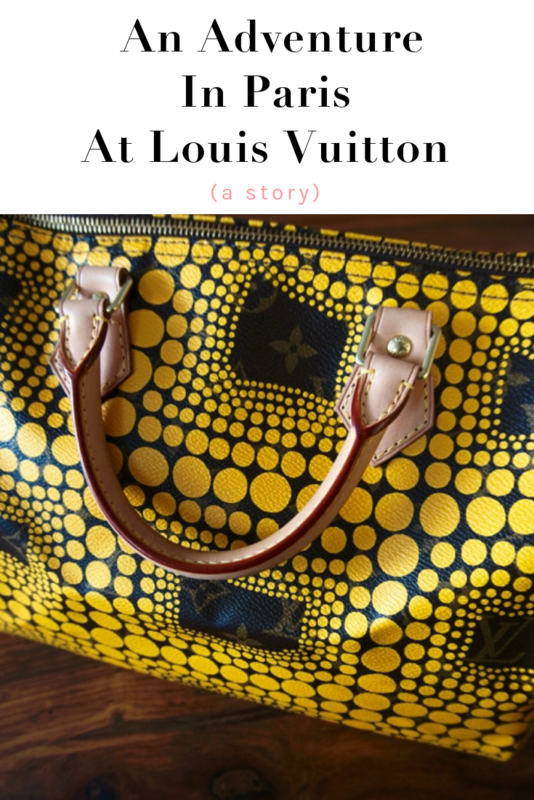 And that is the story about how I bought my Louis Vuitton Yayoi Kusama Speedy. It was quite an adventure, one that I will never forget. The purse is fabulous, of course, but it’s the story that makes it even more so, and the friends that shared in that experience. Here we are, back in Atlanta, meeting for lunch at Nordstrom. It was the Kusama debut party. Yup, we are officially ruined forever. Paris will do that to a girl. P.S. You make also like reading about How To Take A Girlfriend Trip To Paris. Awesome! I am black, lived, and worked in Paris for almost 20 years. I married and had my son in Paris during that time! Eventually returned to the family home in Atlanta. Happily found your blog which bought up great memories! Great story! !